Genuine and Original Aqua One Carbon and Wool Cartridge BULK BUY MULTIPACK for use with AquaStyle (AR) 850, designed to remove small particles of debris along with toxins and discolourants from aquarium water. This great value filter media pack contains: 6 packs with 2 Carbon Cartridges per pack providing 6 complete filter changes. The foam cartridges found within the Aqua One 101 Series internal filter perform the dual functions of collecting solids and acting as a home for beneficial bacteria. The 101 internal filter is used in later model AquaStart 320 / 320T and UFO 350 aquarium. The foam cartridges found within the Aqua One 103 Series internal filter perform the dual functions of collecting solids and acting as a home for beneficial bacteria. The 103 internal filter is used in later model AquaStart 500 aquarium. The foam cartridges found within the Aqua One 104 Series internal filter perform the dual functions of collecting solids and acting as a home for beneficial bacteria. The 104 internal filter is used in later model AquaStart 500 aquarium. Genuine and Original Aqua One Carbon Cartridge for use with ClearView 200 aquarium range. Genuine and Original Aqua One Carbon Cartridge for use with ClearView 300 aquarium range. Genuine and Original Aqua One Carbon Cartridge for use with ClearView 500 aquarium range. Genuine and Original Aqua One Carbon Cartridge for use with ClearView 100 aquarium range. Genuine and Original Aqua One Sponge Pads for use with UFO 880 aquarium range. 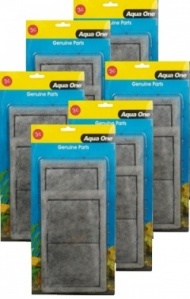 Genuine and Original Aqua One Wool Filter Pad Set for use with UFO 880 aquarium range. 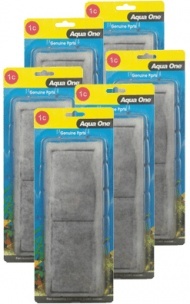 Genuine and Original Aqua One Sponge Pads for use with UFO 700 aquarium range. 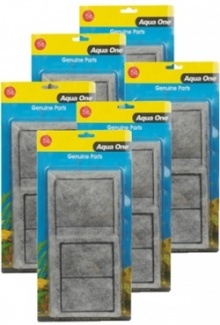 Genuine and Original Aqua One Wool Filter Pad Set for use with UFO 700 aquarium range. Genuine and Original Aqua One Sponge Pads for use with UFO 550 aquarium range. 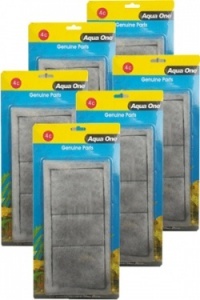 Genuine and Original Aqua One Wool Filter Pad Set for use with UFO 550 aquarium range. Replace every 4 to 8 weeks for best results. Genuine and Original Aqua One Carbon Cartridge for use with AquaNano 36 Marine aquarium range designed to both trap fine particles of waste and purify / clarify your aquarium water. Change this cartridge every 8 to 10 weeks.